A 44-year-old man presented with a two-day history of severe nausea, vomiting and fever with a temperature of 39°C. The patient had a history of ulcerative colitis; however, his symptoms were unlike those of previous flare-ups of the disease. He was experiencing non-bloody diarrhea and had no abdominal pain. His oral intake and urinary output were reduced, and he had postural light-headedness. The patient reported that he had no respiratory symptoms and had not been in contact with anyone who was sick, travelled recently or taken antibiotics. The only medication he had taken before presenting was acetaminophen for fever. An initial clinical examination was unremarkable. An infectious cause of his symptoms was suspected, and a blood culture, stool culture and nasopharyngeal swab were obtained. The patient was admitted to hospital for fluid resuscitation and given ondansetron 4 mg intravenously for nausea. On the fourth day of the patient’s illness, he began to cough up yellow sputum, and a pink maculopapular rash appeared over his abdomen (Figure 1). The rash became confluent and spread to most of his body, sparing only his face, palms and soles. Within 48 hours, the rash had resolved completely. 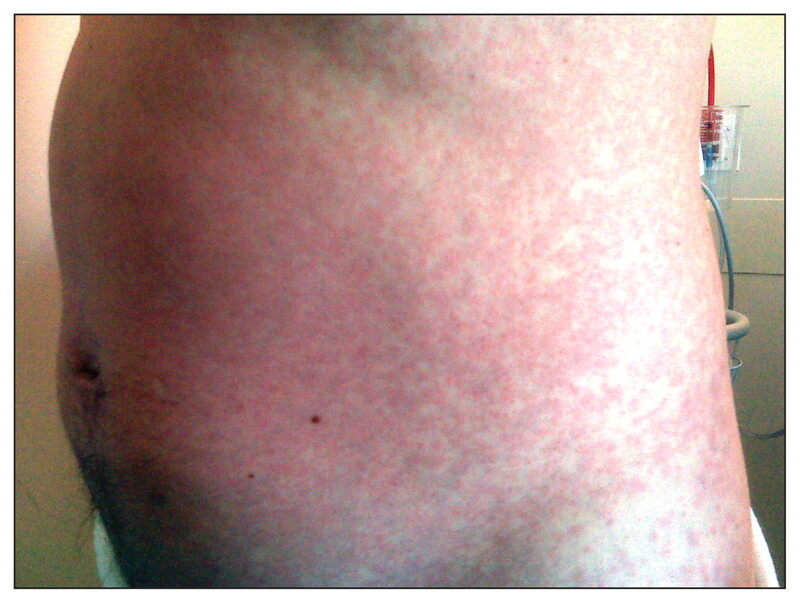 Figure 1: Maculopapular rash on the abdomen of a 44-year-old man with pandemic (H1N1) influenza. The results of the blood and stool cultures were negative, but the nasopharyngeal swab culture was positive for influenza A and confirmed by polymerase chain reaction to be the pandemic (H1N1) 2009 virus. The patient was given oseltamivir 75 mg orally twice daily for five days in accordance with recommendations of the Centers for Disease Control and Prevention. 1 All of the patient’s remaining symptoms resolved over the next 10 days. Typical clinical characteristics of pandemic (H1N1) influenza are reported to include fever, cough, other upper respiratory tract symptoms, diarrhea and vomiting. 2,3 Rash associated with influenza A is typically macular or maculopapular in nature and occurs in about 2% of patients —usually children. 4 Ondansetron has been associated with a rash in 1% of treated adults. 5 Our patient had been exposed in the past to ondansetron, as well as acetaminophen, without adverse reaction. Vigilance is necessary for the timely diagnosis of pandemic (H1N1) influenza. Although rash is an uncommon manifestation of influenza, a high index of suspicion must be maintained for patients who have rash and symptoms consistent with influenza-type infection. During a pandemic, unusual presentations of the pandemic illness remain more common than the usual presentations of rare illnesses. Centers for Disease Control and Prevention. Updated interim recommendations for the use of antiviral medications in the treatment and prevention of influenza for the 2009–2010 season. Atlanta (GA): The Centers; 2009. Available: www.cdc.gov/h1n1flu/recommendations.htm (accessed 2009 Nov. 24). Cutler J, Schleihauf E, Hatchette TF, et al. Investigation of the first cases of human-to-human infection with new swine-origin influenza A (H1N1) virus in Canada. CMAJ 2009;181:159–63. Novel Swine-Origin Influenza A (H1N1) Virus Investigation Team, Dawood FS, Jain S, Finelli L, et al. Emergence of a novel swine-origin influenza A (H1N1) virus in humans. N Engl J Med 2009;360:2605–15. Silva ME, Cherry JD, Wilton RJ, et al. Acute fever and petechial rash associated with influenza A virus infection. Clin Infect Dis 1999;29:453–4. GlaxoSmithKline. Product Monograph: Zofran. Mississauga (ON): GlaxoSmithKline; 2007. Available: www.gsk.ca/english/docs-pdf/Zofran_PM_20070320.pdf (accessed 2009 Nov. 24).